Kevin Casey, intrepid journalist for InformationWeek, rang me up this week for input on his article, “Do Nonsocial SMBs Know Something We Don’t?” In the article, Kevin’s ponders whether SMBs that haven’t bought into social media have good reasons to hold off. 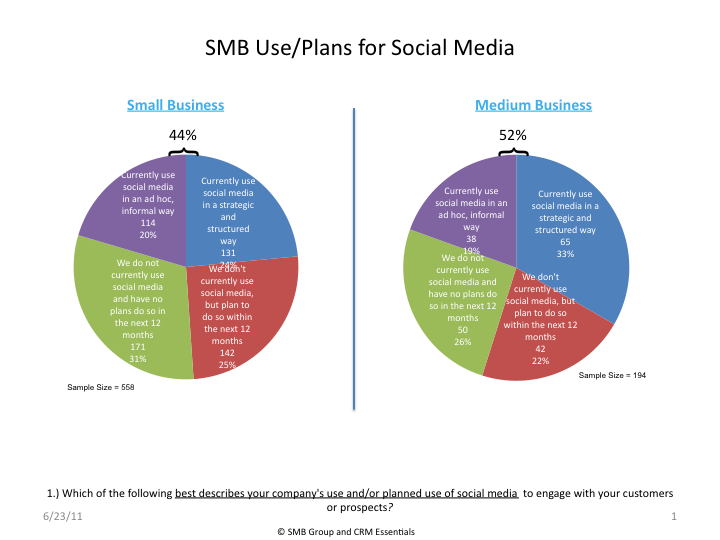 Certainly an under-represented angle on this topic, especially when you consider that more than half of SMBs don’t use social media in their businesses according to a joint SMB Group-CRM Essentials “2011 Small and Medium Business Social Business Study,” conducted earlier this year (Figure 1). Even among SMBs that are using social media for some business functions, many do so in ad hoc fashion–primarily just throwing spaghetti on a Facebook wall. Kevin and I (and subsequently, his article) discussed several issues that hold “nonsocial” SMBs back, including an unwillingness to surrender control, fear of damaging the company’s image, difficulty in measuring success and that it takes too much time and effort. And, these reasons may be valid for some companies. But, after we hung up, our conversation prompted me to re-visit the responses to the question, “What are the top 3 reasons that influenced your decision not to use social media solutions in the next 12 months?” The issues we came up with above align with factors that respondents cited in the survey, such as uncertainty about whether integrated social media solutions will help the business, too difficult to measure effectiveness of social media engagement, and concerns that employees won’t use social media responsibly. 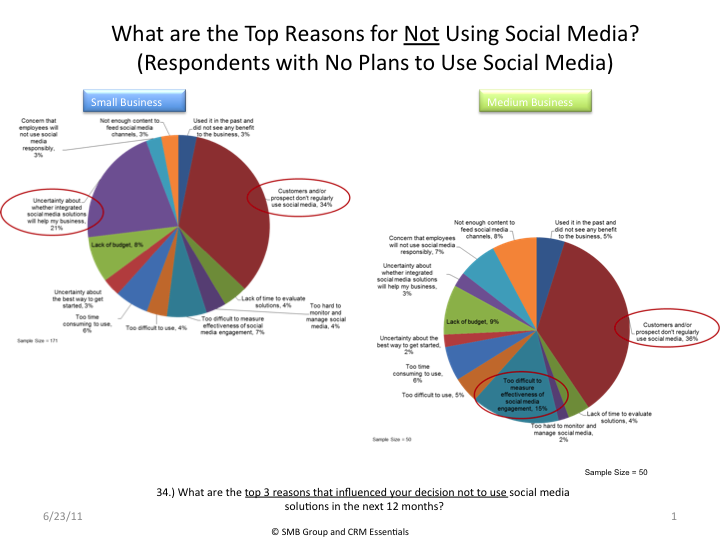 However, the #1 reason SMBs with no plans to use social media cited is that they believe “customers and/or prospects don’t regularly use social media” (Figure 2). If you are in this camp–its time to wake up and smell the coffee! The new Pew Research study, “Social networking sites and our lives,” reveals that 80% of Americans between the ages of 18 and 35, and 48% of U.S. adults over the age of 35 are now using social media–with use of social media sites doubling since Pew’s 2008 study. And that’s not all: Pew reports that the average age of adult social media users has risen from 33 in 2008 to 38 in 2010–and that more than half of users are now over 35. Need more proof that you need to figure out a social media plan for your business? A Wedbush Securities survey indicates that while the number 18 to 34 year-olds who “Like” Facebook content has crept up from 60% in 2010 to 66% percent in 2011, the percentage of Facebook users in the 55+ category hitting the Like button has jumped from 24% to 43% in the same time period. So, while there may be valid reasons for some SMBs to choose not to integrate social media into their businesses, don’t delude yourself into thinking that you don’t need to get into the game because your customers and prospects aren’t using it. The odds are increasing every day that they are–and that your competitors will be all too happy to fill in any gaps you leave in the social media conversation. Social Media: How Does Your Small Business Stack Up?